Supreme Court Justice Potter Stewart, who served from 1958 to 1981, believed that the framers of the constitution singled out the press as the only business with explicit freedom from government. He knew that newspapers, once widely circulated to readers around the nation as the primary source for news, have long served the United States as a vessel to criticize the actions of elected officials. In particular, political cartoons take satirical shots at misdeeds and corruption. Part-news and part-art, these drawings voice the editorial opinions of newspapers. But the judge couldn’t foresee that the Internet would fundamentally alter that relationship at the turn of the century. With ad sales and circulation in decline, the business of news is suffering, and anyone with an opinion on public policy has a shot to call out officials for wrongdoings through the use of new media — blogs, social media, etc. And now print has another new challenger, with memes taking aim at the voice of the paper. A meme is essentially an idea, video, catchphrase or photo that goes viral; that is, people find humor and cultural relevancy in the meme and share it through social media. 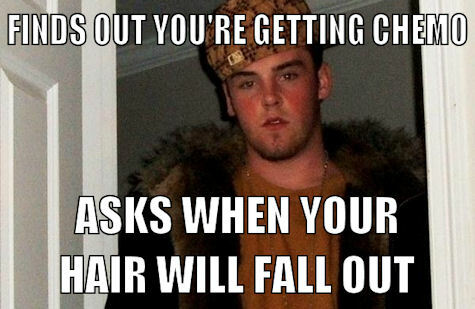 Most people know memes as those photos with witty captions and cultural references – everything from Scumbag Steve (points out when someone does something lousy) to Confession Bear (admits when the creator does something lousy). More specifically, political memes can offer social commentary on politicians or political issues — and that’s the threat that editorial cartoons face, handicapped by the constrictions of the newsprint medium. In early 2013, the United States allegedly faced a recession relapse as a result of tax increases and budget cuts. The situation looked bleak in late 2012 with White House Democrats and Republicans deadlocked in disagreement about how to handle the situation, threatening to send the economy over a “fiscal cliff” — and thus a meme was born. 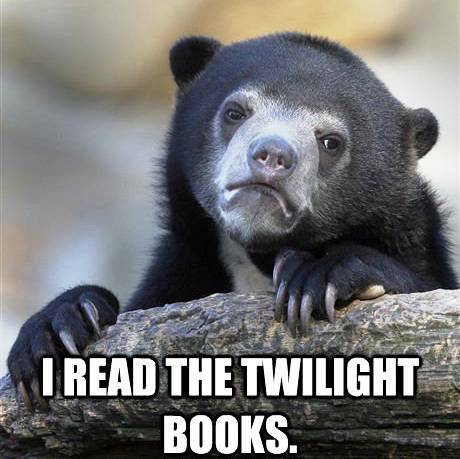 Frustrated and confused, people uploaded loads of memes online. 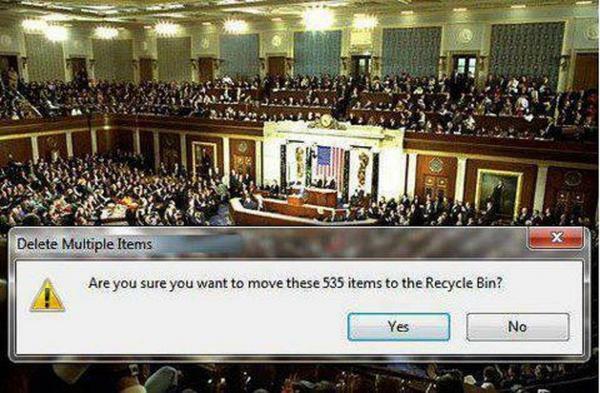 “Are you sure you want to move 534 items to the recycling bin?” reads one that made its rounds on Imgur, an image-hosting website popular with social news sites like Reddit, as a computer dialog screen against a backdrop photo of Congress. The Charlotte Observer had its own jab at Washington with political cartoonist Kevin Siers, who illustrated Republicans’ distaste at compromising on the fiscal cliff deal. 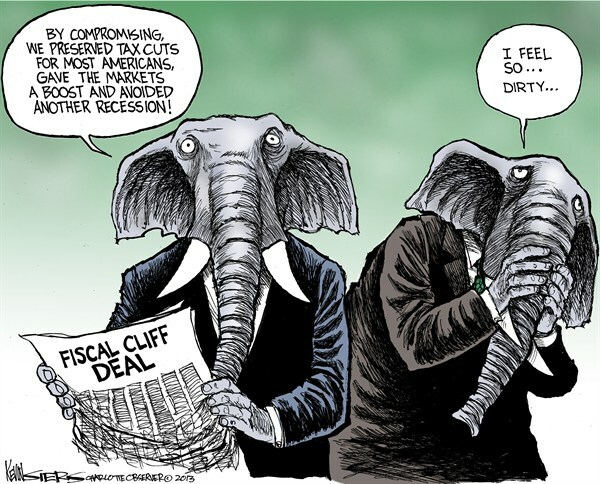 “I feel so dirty,” says an elephant in response to preserving tax cuts — a stray from the party’s platform. Both pictures make their points, but the reach of one is marginal. According to a March 2012 statistic taken by the Audit Bureau of Circulations, the Observer’s daily circulation was approximately 155,000 per day — including electronic editions. By comparison, Imgur averages over a billion image views a day. Not every image makes it to the top of the feed, but once a meme goes viral it certainly has the means to reach a far larger audience than print could. Even the most circulated publication, The Wall Street Journal, only has a circulation of over two million. If effectiveness is a numbers game, the Internet wins again. But creating editorial cartoons, like traditional journalism, is a craft. There is artistry involved just as there is with journalism itself. In 2011, a U.S. district judge in Oregon, Marco Hernandez, ruled that a blogger in the case was not a journalist, laying out a legal standard of who is a “journalist.” The criteria includes education in journalism, affiliation with a news entity, and creating original products instead of assembling the writings of others, as bloggers often do. In comparison, meme makers lack the traditional discipline and art form of political cartoonists. Editorial cartoons grew out of caricature, a style of art rooted in Leonardo da Vinci’s study of the grotesque. Over time, artists began adopting the form, first graphically satirizing socio-religious reforms in the 15th century. Caricature is still found in modern day cartoons like the Democratic donkey and the Republican elephant, as well as the comic strip format that cartoonists sometimes use. Memes too share their own set of similarities, though driven by internet culture as opposed to great artists. Meme creation can be as simple as uploading a photo to a meme-making website, which is programmed to overlay text on the image. They can also involve picture manipulation with powerful programs like Photoshop or simple ones like Paint, the standard Windows application. 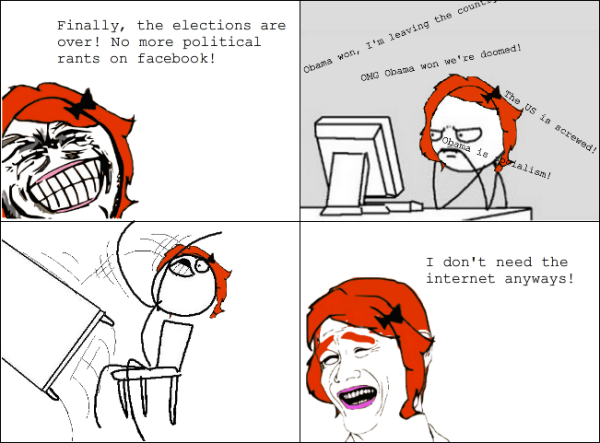 Rage comics, a meme style that emerged on a site called 4Chan in 2008, are drawn with Paint. Like blogs, these are Internet-era tools. Judge Hernandez excludes what many would consider a journalist today from the legal definition – a key distinction which could mean the difference between shield law protection and liability. By his standards, a blogger writing opinion — essentially an online columnist — is not a journalist. Still, it would be hard to argue that posts from such sites have no relevance. And in the same way memes also carry importance. “Memes are capsules of attitudes and emotions,” says Dr. Min Jiang, a mass media professor at UNC Charlotte. If political cartoons are the voice of newspapers, memes are the voice of society. There is still much to be seen about the effects of memes. During last year’s presidential election campaigning, candidates sparked memes left and right. President Barack Obama generated a lot of buzz for comments made about how entrepreneurs needed some forms of government help like infrastructure to build small businesses. 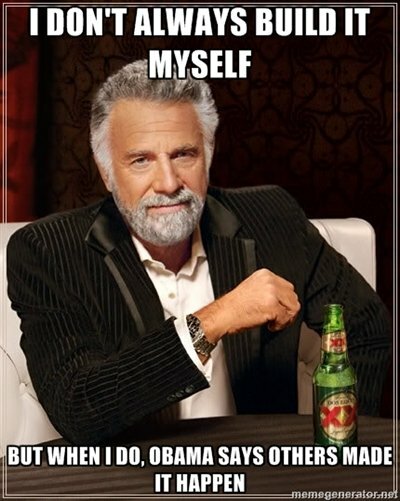 “You didn’t build that” drew sharp criticism and flooded social news sites with memes. 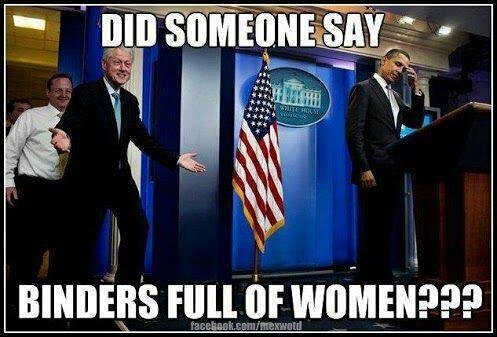 Later in the election season, Mitt Romney caused his own meme movement after news and social media picked up his “binder full of women” comments from a speech about gender equality in the workplace, in reference to his past efforts to hire more women. A Facebook page set up as a Binders Full of Women even garnered over 300,000 “likes” by the end of the week. “Like any means or messages used in political communication, they could have an effect as well as misrepresent,” says Dr. Jiang. Such memes may have the potential to impact an election, but there is not yet conclusive research to really understand the influence of memes. Editorial cartoons, on the other hand, have a history of direct impact on business and politics. Businessman and politician William “Boss” Tweed took the brunt of cartoons illustrated by Thomas Nast. The graphic satire painted Tweed as greedy and corrupt and eventually people believed it, launching an investigation that resulted in prison time. Perhaps memes will one day take down their own Tweed with their far-reaching mass media properties; maybe they already have. It’s already propelled political catchphrases linked to officials, and the editorial voice of the people will continue so as long as the medium does. Given the precarious nature of print, political cartoons face an uncertain future and will likely have to adapt to the Internet just as newspapers have. Whether they’ll survive or not – it remains to be seen. This entry was posted in Week 9 and tagged cartoon, internet, media, meme, politics. Bookmark the permalink. This is definitely a relevant trend of today. I liked the way you presented it as well as the examples used. The only thing I was curious to know that wasn’t shown in this article would be the opinion of a professional political cartoonist–perhaps the one mentioned from the Charlotte Observer–and what they think of memes and how it affects their own business based on the claim of an “uncertain future.” Great article!